Finalize the PTI Bylaws: ICANN is currently incorporating comments received during the public comment process that ran from 12 July-11 August and will post a final version on 18 August. Finalize the ICANN-PTI Naming Function Agreement, which includes the customer service complaint and escalation mechanisms defined by the CWG-Stewardship: This Agreement is currently out for public comment until 9 September 2016, and a final version will be posted on 16 September 2016. Finalize the ICANN-PTI Services Agreement: The Agreement is currently being reviewed and discussed with the multistakeholder community, and a final version will be posted on 16 September 2016. The Root Zone Maintainer Agreement. The ICANN-PTI Protocol Parameters Subcontracting Agreement. The ICANN-PTI Numbers Subcontracting Agreement. The PTI Conflict of Interest Policy, Board Code of Conduct, and Expected Standards of Behavior." 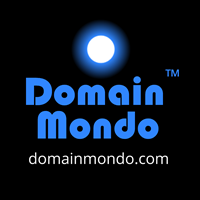 "Two months ago, we passed an important milestone in a nearly 20-year effort to privatize the Internet domain name system (DNS). We announced on June 9 that the transition proposal developed by the Internet multistakeholder community meets the criteria we outlined in March 2014 when we declared our intent to transition NTIA’s stewardship role related to the DNS. While this was a significant moment in this journey, we said in June that the Internet Corporation for Assigned Names and Numbers (ICANN), which currently operates the IANA functions under a contract with NTIA, still had work to do to implement key action items called for in the transition plan. "On Friday, ICANN informed NTIA that it has completed or will complete all the necessary tasks called for in the transition proposal by the end of the contract term. NTIA has thoroughly reviewed the report. We informed ICANN today that based on that review and barring any significant impediment, NTIA intends to allow the IANA functions contract to expire as of October 1. "The IANA stewardship transition represents the final step in the U.S. government’s long-standing commitment, supported by three Administrations, to privatize the Internet’s domain name system. 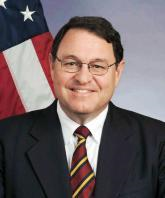 For the last 18 years, the United States has been working with the global Internet multistakeholder community to establish a stable and secure multistakeholder model of Internet governance that ensures that the private sector, not governments, takes the lead in setting the future direction of the Internet’s domain name system. To help achieve this goal, NTIA in 1998 partnered with ICANN, a California-based nonprofit, to transition technical DNS coordination and management functions to the private sector. 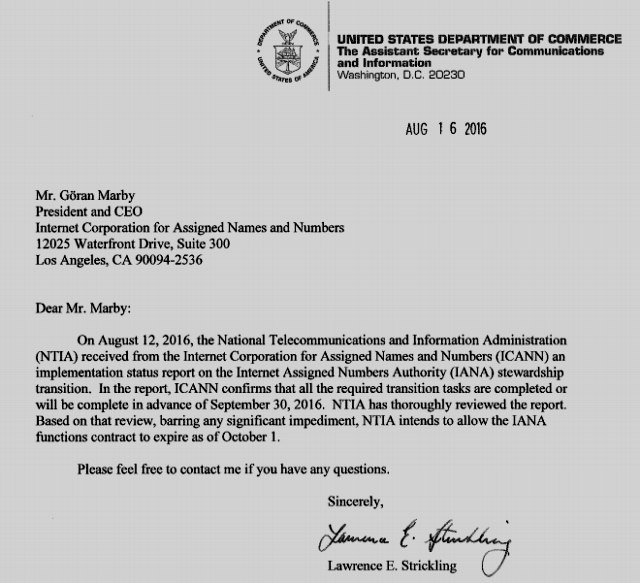 NTIA’s current stewardship role was intended to be temporary. In March 2014, NTIA initiated the final step in the privatization of the DNS by asking ICANN to convene Internet stakeholders to develop a plan to transition NTIA’s stewardship role for the DNS to the Internet multistakeholder community. Stakeholders spent two years developing a thoughtful consensus proposal that meets the criteria we outlined in 2014 and will strengthen the multistakeholder approach, while maintaining the stability, security, and openness of the Internet that users across the globe depend on today. This multistakeholder model is the key reason why the Internet has grown and thrived as a dynamic platform for innovation, economic growth and free expression. See also: ICANN’s 31-page implementation planning status report (pdf).